As a self-employed individual, my life doesn’t have HR managers or Finance teams to assist in my everyday activities. I rely on hiring designated firms or professionals for all the support functions. But more importantly I rely on a community of bloggers and social media enthusiasts to drive me each day. When I began blogging, I found my community in Write Tribe, a story well documented on my blog over the years. It was here I learned all the tricks of the trade and even found my niche when it came to writing. I had so many questions, which all got answered by the veterans in the group. I remember some of my first blogging projects were all due to references I received online. Connections I had made over Twitter while discussing politics, religion and even music! These connections became stronger over time and today when I am hustling behind Blogchatter – these same connections form clients/Vendors as the nature of project demands. The ecosystem thrives on our inter-dependability. But when life moved from domestic to international, as any other person I discovered some hiccups. During my early years of freelancing, I was exposed to International Freelance business through FoodPanda Germany – who wanted to get a truckload of content work carried out through me. From trusting the client to understanding payment methods, I was a bit stumped. 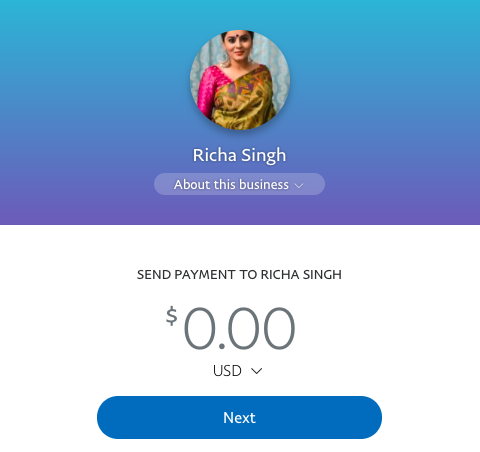 Those days, social media was not so handy and community of freelancers not too communicative – but on referral of client I tried PayPal for my payments and after my initial inhibitions, life with International freelancing has been super easy! Over the last few years, I have seen a large community of freelancers develop around International Clients. In fact a survey notes that 4 in 5 freelancers get international projects. At times, the size of projects and need for diversity sees many of them come together to deliver for a single client. And connecting them all is PayPal. For example, very recently I was offered work from an International brand who wanted an app testing to be carried out and the specifics of the project entailed that I share my PayPal.Me link upfront for easy and hassle free payments. Speaking of PayPal.Me, it is one of the best features offered by PayPal team. You can customize the way you want to, and give your services a unique identity. Simply share your PayPal.Me link with your clients and get paid with the click of a link. 61% of freelancers have faced issues in payments. Additionally they also face issues of trust while dealing with clients. And there have been cases where they have been duped of payments post completion of work. This risk is all the more, higher while dealing with international clients. Seller Protection Policy of PayPal helps self-employed individuals everywhere by assisting them through a dispute settlement court. If an individual is not paid by a client, they can evoke this Policy to settle dues (provided a reasonable point is established by party). With PayPal, me and millions of other freelancers discover that simply by getting on the medium one can take a deep dive into more Opportunities, more Clients, more Business and, more Money! Domestic or International, writing or creating art can be a lonely job. Seek your community online to deliver better projects for yourself. Not only will community assist you in doubts and issues, they will also come together in getting you more projects and better business. Paypal has become an industry standard for remitting money world wide. I truly like the simplicity of the service. Who better than I can understand the importance of community growth. I am growing each and everyday learning from my peers. PayPal was also introduced to me in one such project only and the working has been smooth since then. PayPal makes it so simple to work with US and UK clients. They even set the due dates for you to track! PayPal has made things so easy and seamless for freelancers in India that finally, we don’t need to suffer in a third-world country manner. Totally agree on the building community part in the freelancer’s career. Paypal has indeed helped a lot of freelancer in taking their work global without worrying about money transactions. Community is one such thing that is essential for any being and yet, in freelancing given so little importance. I’m glad you took this up. I have reaped benefits of having a little freelancing community of my own, especially at times when I’m loaded with commitments of a full-time job and freelance deliveries. I began with just writing as a freelance service and then, was asked if I could help with certain designing solutions – like recommendations. At first, I did them myself and later, I started passing on parts of my work (both design and development) to those I knew in my circle. And now, they too have their own PayPal accounts and a growing portfolio. When you pass on your work, you’re passing on your confidence in the system and faith in the other person. I feel that’s empowering and it is all pivoted around one name – PayPal.